The Secret Origin of the Universe. Watch as for the first time in history, The UNIVERSE becomes sentient. Watch as Captain Universe deciphers the code that was hidden in the first five issues. Cover- Our latest and newest black superhero Captain Universe get the star of this month’s far out art décor. 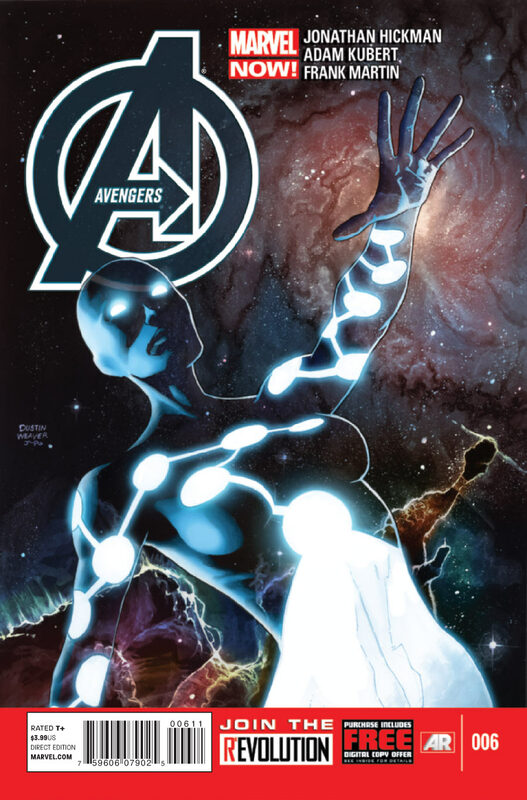 Love the background and the transparency of Captain Universe which literally has her blending into the all encompassing endlessness of a billion, billion galaxies. Continuity- How much do I love the Superior Spider-man? Oh let me count the ways! Here we have Superior being the prick that Peter Parker never could have hoped to be! And we also get him all but picking a fight with mutant superheroes Cannonball and best friend Sunspot/Roberto Da Costa. Humor- Sprinkled throughout Hickman gives us a healthy dose of the chuckles in this one. Background– This issue some of the mystery surrounding the new Captain Universe is revealed much to my delight. See her updated biography for details. Emotional- I was honestly touched by the revelation of Tamara Devoux and her traumatic accident, the loss of her child and the terror that brought after she lay in a coma for so long. Repercussions- This issue we learn that the universe itself is broken and dying, this may have something to with the end of creation itself as mentioned in the New Avengers (2013) series or it may have to do with another major yet unrevealed disaster. Hickman also ends the issue with a mysterious “White Event” occurring literally leaving me begging for more! Just what the hell is this white event? No idea! But me and you have to stick around until next month to find out! Black Super Heroes– Night Mask/Adam, Captain Universe and Sunspot! Woot Wooot! Machine Builder Code– Nice touch of Hickman to include how to decipher the language used by Adam/Night Mask. This also adds new shelf life to earlier issues as I literally grabbed Adam’s first appearance and checked to see what the hell I missed the first time through. I also used it to decipher what Adam said to Spider-man before the Universe allowed him to speak English. Art- My man Adam Kubert is on art and he does his very best. 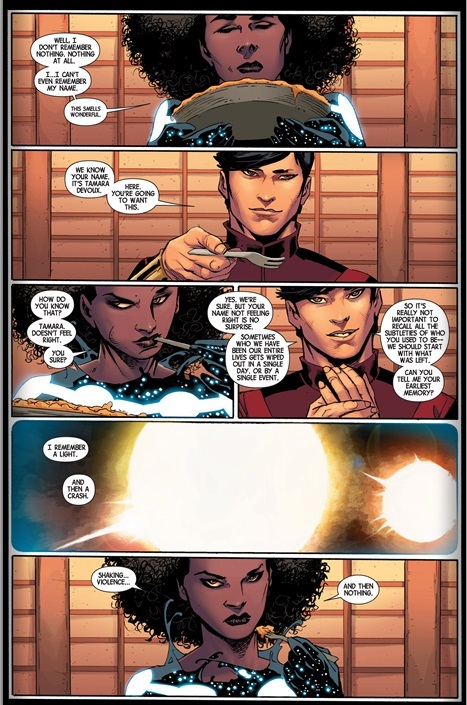 Asian Shang Chi has these wonderfully crafted authentic eyes while Universe’s thick afro is just lush and full of life. Night Mask also has a distinctive design that he’s streamlined. A black hero with cosmic power?!? Unheard of, I love it! The white event been upon us! Lol.